Well, if you made it here, you are probably interested in my “Super Truck” concept. I’m just calling it that right now because DIY Open-Source Plug-In Hybrid Diesel Electric Pickup Truck is more than a mouth-full. 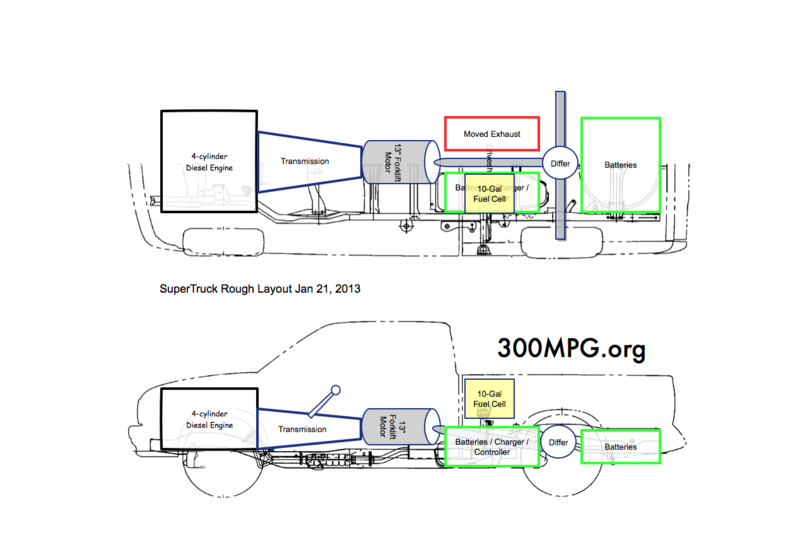 The basic idea of the project is to combine a diesel engine (running on bio-fuels) with an electric motor from a forklift, along with the needed motor controller, batteries, and charger to make a truck that is both high fuel-economy AND a practical vehicle for farm, homestead, and general use. So far, I have the engine from a Mercedes 240D, an 11-inch series-wound forklift motor, and a Chevy S10 truck and manual transmission. The fun will be in combining the diesel and electric motor, and then working on Open Source electronic designs of the motor controller, charger, and BMS. I’ll add links to the end of this entry as the project progresses, so that I can continue to post about the project as we get more done. Things I know nothing about… Fiberglass! Holding it all together when it’s all falling apart. The 240D transmission is an automatic. I want to use a manual for both fuel economy AND to give the driver better control. The neutral position on the transmission will disconnect the electric motor from the transmission, allowing me to drive down the road on just electric WITHOUT it spinning the engine. The transmission will be from the truck, so the transmission mounts will be fine, it’s ENGINE mounts I’ll have to work on as well as a way to mount the electric motor to the frame of the truck. You are a natural Ben ! Keep up the good work ~ I was wondering if the trans gears are spinning when in neutral /electric mode ? The transmission gears shouldn’t be spinning any more than they would on a typical manual transmission vehicle in neutral. I want to keep the drive-shaft connected for simplicity, cost savings (those disconnects cost $750-$1000!) and to retain “engine-braking”. People have also asked about an “overrun clutch”, but I don’t want to do that for the same reasons. Para aportar algún comentario desearía saber que recambio de generador ha realizado pués el de S-10 debe ser de 12 voltios-120 Amperios y la carretilla, supongo de 48 v. ¿? Amperios. I like the idea of a fuel tank (or tanks) over the wheel well or otherwise out of the way in the bed. As for the engine. The diesel is pretty much the exact same size as the gas engine (except taller.) I don’t think there is going to be any spare room under the hood for batteries. A big downside of hybrids is that you end up with MORE components, MORE space used, and MORE weight. The upside will be redundant drive systems, great fuel economy, fuel flexibility, and renewable energy fuel. One other option would be to build a raised bed floor that is removable or hinged this would give you room to place your forklift motor in the bed right after your cab. How many miles are you thinking your batteries are going to get you in your current setup idea? My question is could use your diesel engine to charge one bank of batteries while you run on another bank this is an idea from your metro setup. A section of raised bed might not be a bad idea. I was thinking maybe built-in toolbox sort of a thing. A friend of mine did an EV pickup with all the batteries under the bed, and it was a tilt-bed. BUT, he ended up NOT having room for TWO of the batteries. So, he cut a hole in the bed around where those two batteries would go ABOVE the bed-line. The bed would tilt up and down OVER those two batteries. It was funny that all but two batteries were hidden, so it looked like the truck was powered by just those two! Using the diesel to charge a high voltage battery pack starts to complicate things. A person needs to actually know something about electricity at that point. You also start getting into higher costs trying to deal with a high voltage generator, and run out of room under the hood fast too. For now, I was NOT planning on any sort of additional charging like that. There are some plug-in diesel-electric hybrid school busses in my area that are plug-ins. They start with a charge and simply use the energy until it runs out. After that the diesel engine keeps driving the bus, but doesn’t provide any sort of charging. Once the bus is done with it’s morning run, it returns to base and recharges until dropping kids off from school in the afternoon. 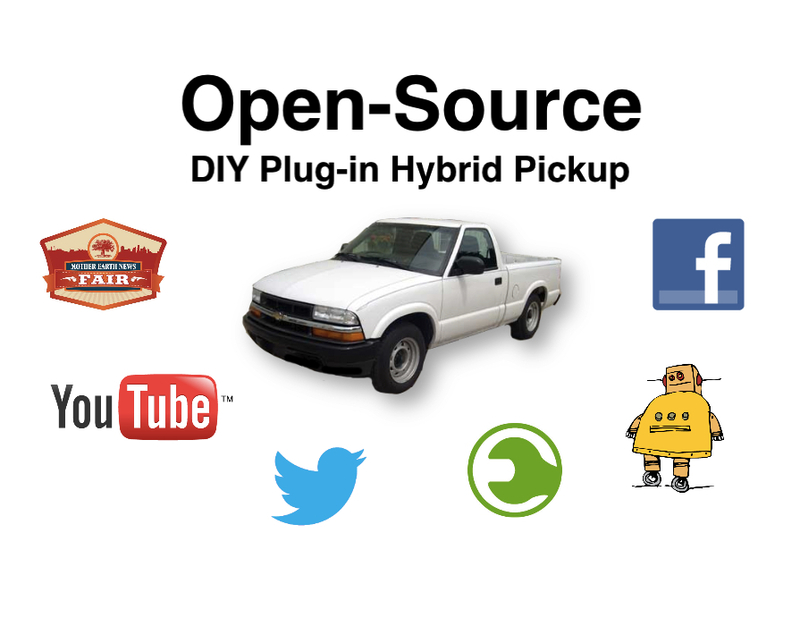 hello, … I really want a hybrid kit for a 1989 toyota pick up 4×4…. Whats the first step you recommend.? I like the idea of the motor between the transmission and differential, but there are some vibration issues that might destroy the electric motor. U-joints change geometry as they rotate causing a slight slowdown and speedup during operation every rotation that shakes or vibrates the shaft between the u-joints. This vibration may cause wires to rub and short out in the motor, not to mention possibility cracking ceramic magnetics or metal castings. Also the electric motor may not be balanced for possibly higher rpm service. Also the driveshaft moves relative to the truck body, transmission, and the suspension. A brace for the electric motor will be tricky if it is not somehow bolted to the transmission. As a side project, a crankshaft position sensor connected to a PWM for the electric motor could be programed to eliminate power pulses from the transmission for a smoother ride. As far as I know of, there ARE NO hybrid truck kits. The closest I’ve seen is that Netgain offers motors with a driveshaft and tailshaft and a software box that can let you drive the motor contoller with your existing gas pedal. Take a look at their site, it might give you some good ideas. a great idea and it has made me rethink my plan Hydrostatic drive for an armoured car project i am working on, Diesel electric could i just use a motor to power the vehicle with no battries? Hello Ben, I’ve been obsessing over a hybrid electric conversion lately, trying to read and learn in a “exam crunch” fasion to figure out what is the best and most cost efficent way (ev with generator, what kind, size, calculating kw to wh/m, distance, on and on) to build a diesel/electric hybrid and get away from gas pump anxiety! Ive stumbled upon all your projects at different points in research and my hat goes off to you. I hope you are still excited about your supertruck because I know I am and I’m sure I’m not alone. Please give us an update and btw I’m in ND and wouldn’t mind shaking your hand and pitching in for a weekend, I know the knoweledge I’ll gain to put towards my project would make the trip well worth it. Thanks again for the information and motivation buddy. Sorry, not updates for a while. I’ve been busy taking several college classes while working and trying to earn a living. Also, I haven’t been able to see much a friend who is a real diesel and transmission guy. Will my lowly truck skills, progress has been slow. I did get the new style glow plugs. I’ll have to shoot a video of installing those. I hope to really get back on track with this project and have some videos and photos to show of the project as it goes. I’m about 30 miles west of Milwaukee, WI. If any electric/hybrid/DIYers are ever in the neighborhood, I’d be happy to visit. When will you post more on ‘Supertruck?’ I keep looking but the last I see is July, any changes? I look forward to my next custom project and seeing more about yours. The weather is finally starting to get nice enough again to work on it. 30 below most of the winter doesn’t help projects like these! It’s been a slow project, but I’m chipping away at it! First, epic congrats for you Ben and for the whole crew involved in this wonderful project. Using peltier modules on the exhaust pipe to recharge a supercapacitor bank, which could store and discharge energy sharply for the motor plugged on the transmission. Well, its about harnessing waste energy for internal combustion engine and drive it through to the electric motor. Dummy or not for as it seems my tweak, I hope to hear from you any opinion about that. Thanks a lot and I strongly meditate for your success because mine relies on yours. What a great project. I will be following closely. I have a 4×4 Ranger with the infamously underpowered (but perfectly running) 2.8 litre engine that I’ve been considering similar conversion for. Why mess with a fancy air compressor (Turbo charger) when…. Any progress this last year? I have a 1999 s10 conversion I picked up last year and came across your project and am very curious to see how it works. Keep it going looks great so far. The Mercedes transmission was a three-speed automatic. As Colin Chapman from Lotus used to say – add lightness. You cannot start off with a large, heavy, cumbersome US truck and hope to achieve any great savings. You need a light truck, the weight should all be in batteries, to give you low down stability and COG. Also your frontal area is very important for your drag coefficient. Engine is too big. You need a 1.5 – 2L diesel. Ben, could you use the dc motor with trans in neutral to get up to speed (35 mph) and then shift and let the diesel take over from there? would you need anything but a normal ev controller and a 2nd throttle? Thank you so much for getting my brain going. Has anyone successfully attached a AC/DC motor to the main shaft pulley of a Gasoline or Diesel Engine (to convert the Vehicle into pure hybrid) in such a way that Engine’s different RPM & LOAD should be 100% synced with the DC motor’s RPM & Torque with a delay not more than 0.2 seconds? If yes, then can you please tell me that which motor controller model you have used? and how you have given Engine’s live RPM & Load to the Motor controller’s throttle?